Auto Traffic Buddy Review. Does It Work, Do You Need It? Auto Traffic Buddy (ATB) is WordPress plugin that builds backlinks to your inner pages by syndicating snippets of your posts to network of WordPress Multisite blogs. Watch the video below to get an idea how the system works. The whole idea of getting contextual (links in the body of the article) backlinks is not new. All blog networks work on this same principle – you submit an article and link back to your site using keywords that you’re trying to rank for. Article gets distributed to one or number of blogs on the network and you get contextual links from aged domains with healthy Page Rank. This strategy works very well – quality blog networks like Build My Rank have been showing great SEO results. When using private blog networks you either have to spin your articles or submit unique and original piece of content, both of which implies some work and effort on your part if you want to get results. Auto Traffic Buddy leverages idea behind private blog network but automates whole process of creating and posting content. There are two core components of Auto Traffic Buddy system – plugin itself and network of WordPress Multisites. You install Auto Traffic Buddy (ATB) plugin on your “Money” blog and it will start syndicating snippets of your existing and new posts to different blogs on ATB network with link back to the original post thus giving you keyword rich contextual links… all done automatically. You simply enter in a list of keywords, and Auto Traffic Buddy system automatically creates blogs within the ATB network. Each blog is on its own “C Class” IP and is not tied together, with any other blog in your ATB network, in anyway. The amount of blogs created is dependent upon your membership level. Regular members start with 20 blogs and get an extra 2 added each month. Platinum members start with 40 blogs and get an extra 10 added each month. The ATB network is a 100% private system and is owned by both ATB customers as well as the ATB owners. You can add your own Multisites to the ATB network. Adding a Multisite to the ATB Network earns you 10 credits which you can use to build 10 blogs on ATB network in addition you will get an extra 1 credit a month. Please note you can only add 3 Multisites to the network at this time for a maximum of 30 credits plus 3 extra credits a month, adding your own blogs is not required though. When a new post is added to your blog, a snippet of the original post is added to a random number of your created “ATB Network Blogs” with a link back to the original post. The random number is based on a preset variable that is configured in the ATB plugin settings. You have an option to let ATB system spin titles of the posts for you or you could syndicate original ones. To improve discovering and indexing of the links, ATB plugin creates RSS feed of ATB blogs that are linking to you and you submit it to different RSS directories and feed aggregators like IceRocket.com, FeedAge.com etc… Those High PR RSS directories are crawled very often by Search Engine spiders so your links will be discovered quicker, plus you get a link from those sites to your ATB blog. PLUS ATB has a back end promotion system that promotes that post to a variety of third party services, such as Twitter, Tumblr, Blogger, Xanga etc. This helps to ensure that your new post submitted to the ATB Network Blogs get indexed by Google as soon as possible so the link can be counted by Google. This is important, as it is critical to optimizing the performance of this system that EVERY link be fully recognized by Google. One of the best things about Auto Traffic Buddy is that whole thing is automated – it should take you about an hour to setup the system, including watching training videos, setting up blogs and installing the plugin; after that it is all done automatically for you – plugin will start syndicating snippets of your posts, building keyword-rich links to deep pages of your site. Auto Traffic Buddy is not a magic bullet for link building and is not enough by itself to rank you for any competitive keywords right out of the gate (see more on this below). These days you have to mix sources of your links in order to get best results. It is however fast and easy way to generate link to inner pages of your site automatically. 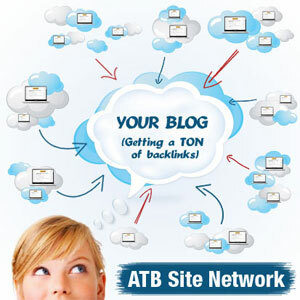 Most of the blogs on ATB network are relatively new (from what’ve seen 1-3 years old) and when you start using the system your multisite blogs will be PR0, but as you start posting content and building links to them they will be gaining PR and trust with Google so overtime you will be getting better SEO value from those links. This system gets better with time. Auto Traffic Buddy plugin takes random pieces of your posts and distributes them to your blogs on ATB network, as of right now there is no option to spin or rewrite them so all those snippets are identical even though they differ in word count. It would have been nice if ATB developers would add an option to spin/rewrite snippets of the post as this would allow post somewhat unique and original content on ATB blogs thus improving index penetration (getting more pages indexed by Search Engines). If the link is not indexed by Google then there is no SEO benefit from it; that’s why you want all of the pages on ATB blogs that link to you to be indexed by Google. Auto Traffic Buddy will create RSS feed of all the ATB blogs that are linking to you; this auto linking feature will help you get your posts indexed and generate additional links to them automatically, BUT you have to submit that RSS to feed aggregators and RSS directories to get benefit of auto linking. Submission can be done manually or using software like RSS Submit or outsourced to one of the submission services in any case make sure you double check the results to verify that your RSS feed was actually accepted. Auto Traffic Buddy only work with blogs that publish content in English so if you plan to promote your non-English website with ATB – it won’t work. Your ATB blogs are like your own private blog network so how does it compares to established blog networks like Build MY Rank or LinkVana. Domains of ATB blogs are relatively new, you will start with PR0 so links will carry less value in the beginning BUT you don’t have to write any content and you only need to setup the system once. I think that Auto Traffic Buddy is a great compliment to High-PR private blog networks as it is very low maintenance, easy way to build links to all of your sites at once. If you’re like me you probably have a lot of blogs in different niches so writing unique content for all of them at once is huge pain in the rear. In example you need to submit at least 20-30 posts targeting low competition keyword phrase to Build My Rank network to see positive movement in SERP’s, so if you have 5 websites and only 10 keywords per site that’s 5*30*10=1500 posts. 1500 unique posts, even at 150 words, it is a lot of writing, by installing ATB plugin on those 5 sites you can start building targeted links to deep pages automatically while you promote most important keywords through high-PR blog networks like Build My Rank or LinkVana. Auto Traffic Buddy is an easy and automated way to build keyword rich links to any number of domains and the system gets better the more you use it. If you want to get maximum exposure and benefit from ATB – submit RSS feed of your ATB blogs to largest RSS directories and aggregators so you can get additional links and faster indexing.